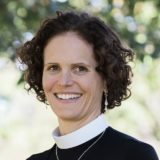 The Reverend Serena Wille Sides joined Christ Church as Assistant Rector in June 2017. Serena is responsible for our Children and Family Ministry, and, along with Cara, leads our liturgy, preaches, and develops adult faith formation in small groups. Serena graduated in May 2017 with her M.Div. from Virginia Theological Seminary and was ordained a priest in June 2017 at the National Cathedral. Serena served for 1.5 years as our seminarian. Born in Washington, DC, Serena spent her childhood and youth in DC and Connecticut. She received her B.A. from the University of North Carolina at Chapel Hill, majoring in political science and minoring in Russian. Serena spent a winter season skiing in Alta, Utah, before attending and graduating from Harvard Law School with her J.D. She practiced corporate law for 12 years in New York City and Washington DC, specializing in financial transactions and regulations. She also did a two year stint in national security, mostly working as a staff member of the National Commission on Terror Attacks upon the United States (the “9/11 Commission”). Serena and her husband, John, have two children, Ethan and Hannah and live in the Tenleytown neighborhood of DC.